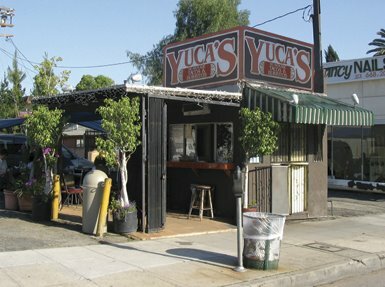 Owned by the Herrera family and well known to Los Feliz locals Yuca's has been serving up authentic yucatan mexican food since 1976 from a tiny hut on Hillhurst Ave.I first stumbled on to this gem several years ago when I noticed a crowd gathered at lunch time and I've been a big fan since. My favorite burrito in Los Angeles is hands down the cochinita pibil at Yuca's. It's delicious slow roasted pork yucatan style with beans(cooked with lard...mmm lard) and pico de gallo. Having never tried the cochinita pibil tacos or the carne asada tacos at Yuca's I was curious to see how they measured up to the delicious burritos. I ordered two tacos, a carne asada and cochinita pibil. There's no salsa at Yuca's which may not sit well with some taco eaters. 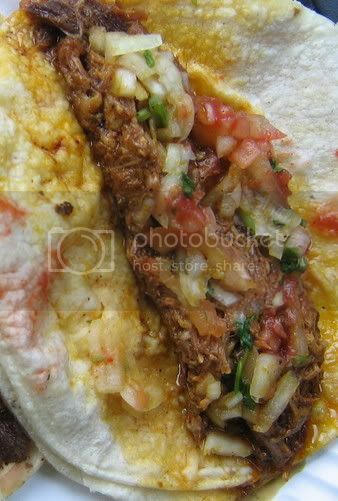 I've never missed not having a salsa when eating one of their burritos but while eating my carne asada taco I could have really used a salsa roja to even out the dryness of the corn tortilla and the texture of the beef. The carne asada was well prepared and excellent but the small amounts of tomato and onion couldn't provide the right balance every great taco needs. The cochinita pibil on the other hand needed no salsa to provide this balance. The juicy seasoned shredded pork soaked in a hearty gravy that stained the corn tortillas was magical . Any salsa added to this invention may have tarnished it. As far as beverages Yuca's offers lemonade and fruit juices. If you want something with more bite head to the liquor store next door for a cold beer or soda. By the time you return to the hut your food will likely be ready. 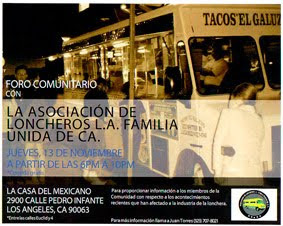 Then just kick back in the patio area or on the hood of your car and enjoy an LA institution. was gonna check out yuca's very soon... yoony at immaeatchu is addicted to their burgers so i have a dilemma.. i guess i'm just gonna have to get tacos and burgers there.. I've heard they have great burgers too. Don't forget the cochnita pibil burrito. Whoa Bandini - Cochintia Pibil is delici-yoso!!! Though I've never had the real deal in Mexico, any roasted/stewed pork that is not greasey is great in my book! i love yuca's! the carne asada burrito is awesome but haven't tried the cochinita pibil one, although the torta was good. 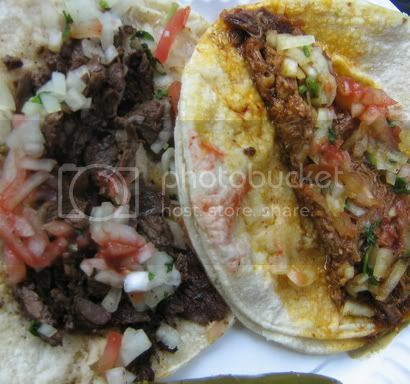 i'm just pretty much addicted to the carne asada tacos and burritos i find it hard to move on. but next time i'll try out. can't ignore the "best burrito in LA comment. the cochinita torta at yuca's is easily one of the 5 best sandwiches in los angeles. and the sublime saturday-only tamales (although a little bland compared to everything else) are definitely worth checking out. Bandini, like DCCFries, I heard about Yuca's threw Yoony of Immaeatchu - she loves that place. I'm on the westside, and am too lazy to go get a taco. I usually end up going to Benito's - which I think is nasty. But when it's 3:43 am and you're hungry, Benito's it is. Somewhat overrated, but I appreciate the nice hot sauce bottles they have. Jonah at la.foodblogging.com is a cinco de mayo fan but I havn't had a chance to check them out yet. Yuca's is far and away the best mexican restaurants in Los Angeles and I have tasted everything on the menu. I recommend first of all that you should try and arrive atleast an hour after the start of the mid-day lunch rush since the line can be out of control and seating is limited. Also the liquor store next door has a wide selection of drinks and it is common practice for regular customers to run next door to grab a beer or whatever fits your fancy :P Anyway, here is my advice on what to order. 3. Hamburger ( Holy $%#&! Yeah I know that its rare for a mexican restaurant to have good burgers but I guarantee its the best burger you'll every eat for 3 bucks. And those are my recommendation which covers almost the entire menu :P That is in fact the beauty of Yuca's, its simple. Yuca's catered our wedding and they were super nice and easygoing, provided lots of delicious food, and were reasonably priced. I recommend them highly for events! One of my most sophisticated, worldly wedding guests said that this was the best food she had ever had at a wedding. Thanks for the tip! My brother lives in Silver Lake, not too far from Hillhurst and it's good to know there's a taco joint of this caliber in the neighborhood. Best taco stand in LA. I understand the concern about lack of salsas at Yuca's, but the "El Yucateco" habanero hot sauce bottles they keep on hand (in 2 varieties) do the trick for me. Sometimes the hot sauce is in high demand and you need to bug someone else to "borrow" some; but since everyone is usually pretty serene while they're eating Yuca's, it's all good. The el yucateco green sauce is far more tasty in my opinion than the red, and blends so perfectly with the pibil, one of my favorite flavor combinations on earth.